Genotox Laboratories is a CLIA certified high complexity laboratory using cutting edge diagnostic technology to perform urine drug screening and pharmacogenetic test for patients. The test results provide doctors useful information for personalized drug prescription and lead to optimal patient care. 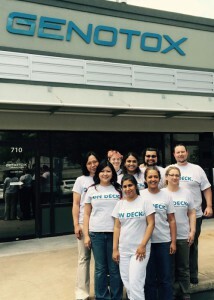 Since 2012, Genotox has hired 13 ACC students. Eight of them are currently employed at Genotox. The ACC program has provided these students with excellent hands on laboratory training. Graduates of the program have good understanding of all aspects of laboratory science from experimental design to execution and documentation. The excellent performance of these ACC students at Genotox has made ACC graduates the preferred candidate for new hire at Genotox.